Note: When making decisions, remember this summary describes typical practices, not best practices. For best practices in product management and marketing, attend a Pragmatic Institute seminar. How has your job changed over the last two years? The typical product manager reports to a Director or Vice President in the product management department. When looking at staffing, it’s often helpful to see how ratios of product managers compare from your company to the industry norm. We looked at responsibilities for each of the 37 activities on the Pragmatic Institute Framework™. So, for example, 73% of people with product management and product marketing titles claim responsibility for an understanding of market problems while only 24% claim responsibility for win/loss analysis. 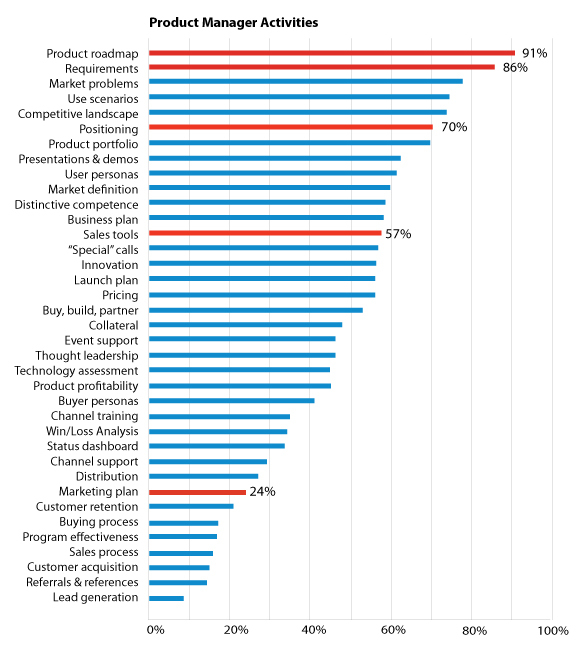 Here we see the activities and percentages sorted from most to least, showing “Product roadmap,” “Requirements,” and “Market problems” are the most common activities claimed by those with product management and product marketing titles while, at 15%, “lead generation” is least cited. Business, Technical, Marketing, and Sales support. Titles are a mess in our industry. What one company calls a product manager, another calls a product marketing manager. In general, when both titles are present in one organization, product managers are focused on technical and business activities while product marketing managers are focused on go-to-market activities. 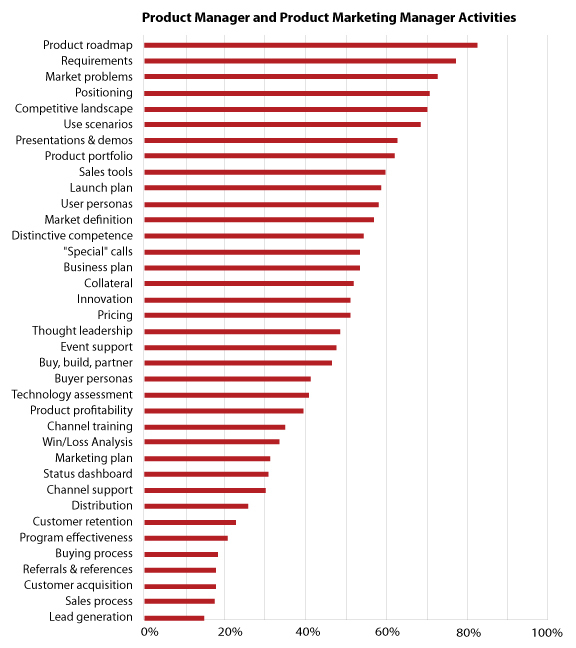 As you can see, product roadmap and requirements are the responsibility for over 80% of those with a title of Product Manager. 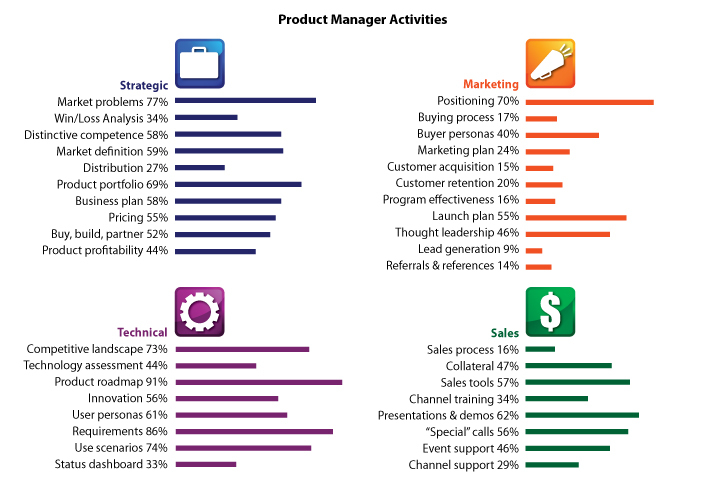 Looking at the same data in groups, it’s clear that product managers tend to focus on the technical activities shown in the purple boxes below; however 70% of product managers also claim responsibility for positioning. 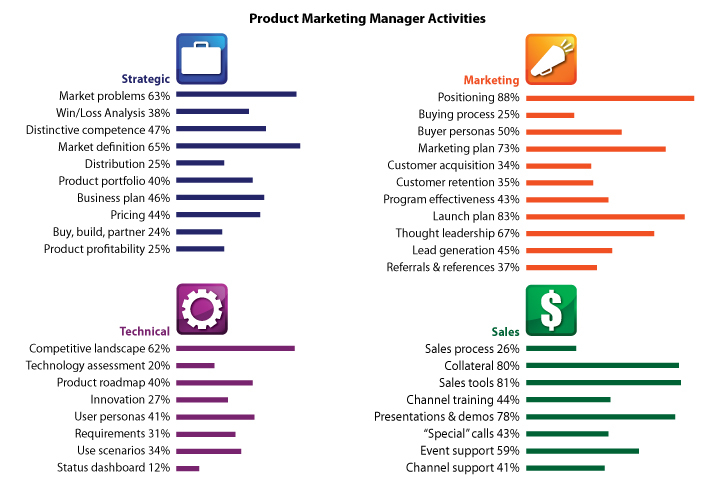 While product managers tend to focus on technical activities, Product Marketing Managers are more inclined to focus on go-to-market activities. 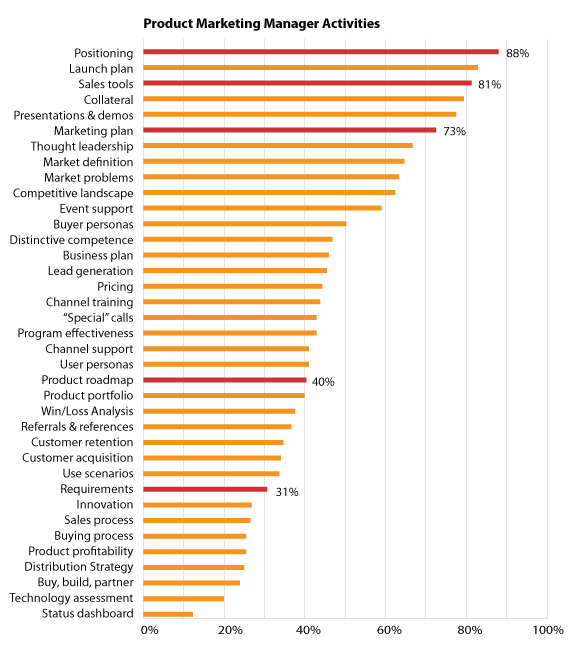 Positioning, sales tools, and marketing plan all rate greater than 70% while requirements and product roadmaps (which were rated very high for product managers) are less than 50% for product marketing managers. 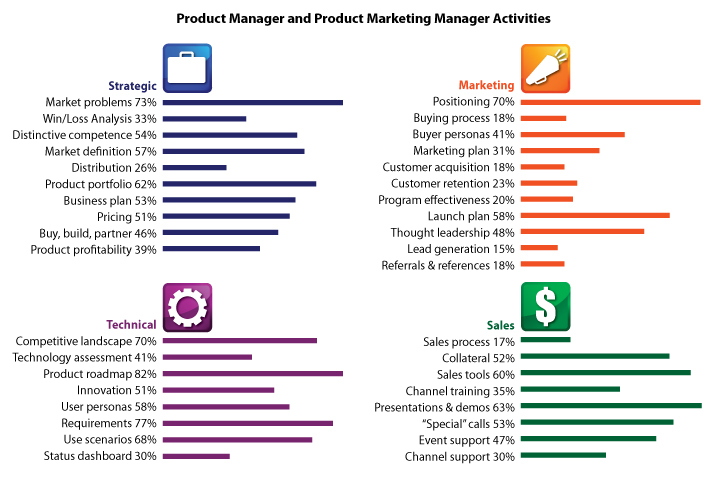 Companies with both Product Manager and Product Marketing Manager titles tend to orient product managers to business and technical activities while product marketing managers focus on go-to-market and sales support activities. I am doing three jobs at the same time. 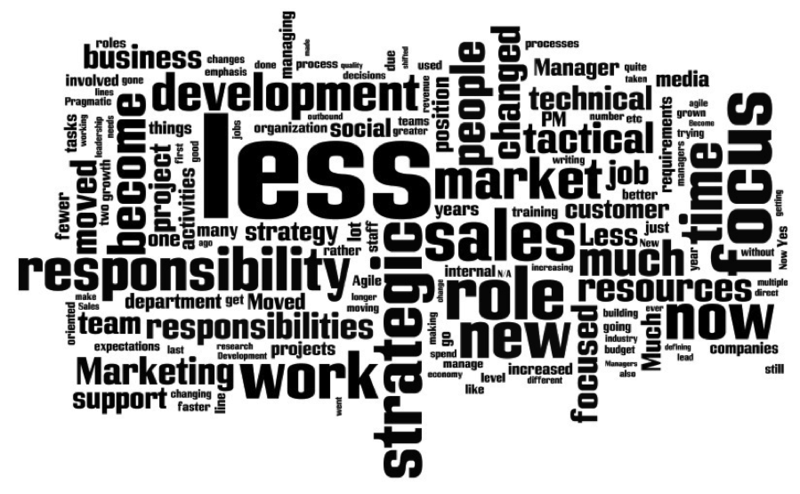 Fewer people to support my products, in all parts of the company: Marketing, Engineering and Operations. Agile has rolled out further through the company. Development process has moved to Agile model necessitating a change in how requirements are communicated. In general I believe that this is actually more in line with the Pragmatic approach so I’m ready! More market oriented with increased customer interaction. Our short-term orientation means less focus on long-term strategies. We’re constantly whipsawed by the urgent needs of the next sales presentation or inside-out product idea. Company strategy needs to be created, communicated and measured throughout implementation. Product expertise and industry awareness must be expected within all departments of the company. Allow more control from employees below upper management in doing their own jobs. Steve Johnson is a recognized thought-leader on the strategic role of product management and marketing. Broadly published and a frequent keynote speaker, Steve has been a Pragmatic Institute instructor for more than 10 years and has personally trained thousands of product managers and hundreds of company senior executive teams on strategies for creating products people want to buy. Steve is the author of the Product Marketing blog.